An atmosphere of gloom hung over the site of the Tham Luang caves in Thailand's northern Chiang Rai province yesterday as rainclouds rolled in and news broke of the tragic death of one of the rescue divers trying to save 12 young boys and their football coach who remain stranded inside. The death of Saman Kunan (38) a volunteer and former Thai Navy SEAL, came as a cruel jolt to the tireless efforts of divers, engineers and caving experts who have been working furiously to extract the children aged 11-16, and their football coach (25), since they were found sheltering in a muddy chamber on Monday. Petty Officer Kunan died on his way out of the cave complex where he had been delivering air tanks to different locations along the treacherous submerged route that leads to the chamber some four kilometres from the main exit. "His job was to deliver oxygen. He did not have enough on his way back," confirmed Passakorn Boonyalak, Chiang Rai's deputy governor. He had started his dive shortly after 8.30pm on Thursday and his diving buddy tried in vain to revive him in an underground cavern after he passed out, but he was declared dead at 1am in "Chamber 3", a staging area for the rescue operation. Mr Kunan, who was a professionally trained diver, appeared from his Facebook page to also be an avid runner and cyclist. The tragedy was a frightening reminder of how dangerous it would be to dive the boys, in a weakened state and some unable to swim, through a labyrinth of winding, dark passages which take even fit, expert divers five hours, using four oxygen tanks, to battle through strong currents. 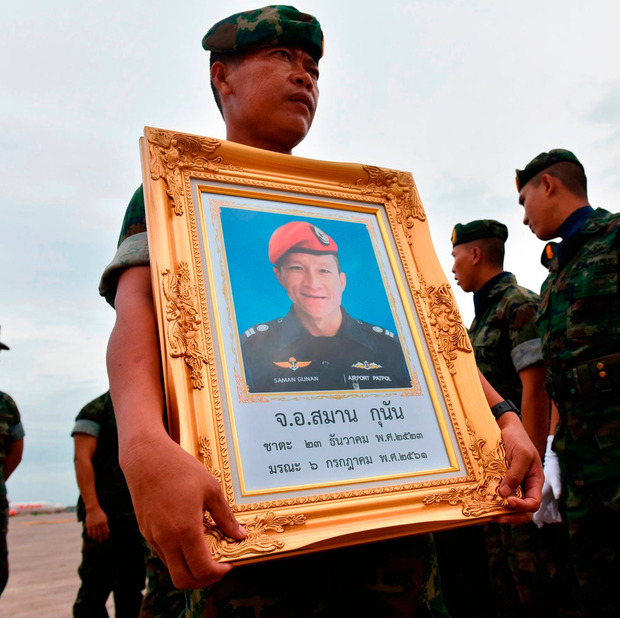 "Inside the cave is tough," said Thai Seal commander Rear Admiral Arpakorn Yookongkaew. But he added: "I can guarantee that we will not panic, we will not stop our mission, we will not let the sacrifice of our friend go to waste." 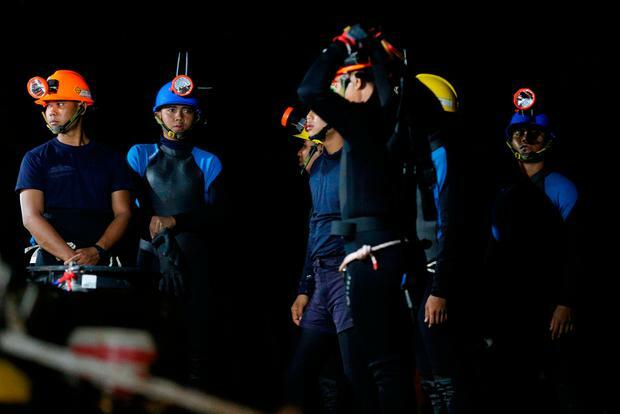 While determined to carry out their mission, some rescuers have questioned the high risk strategy of extracting the boys through diving out, even though they are currently being trained how to use scuba gear. Bin Bunluerit, who works with one of Thailand's largest rescue foundations, said it was too dangerous. It's "not working," he said of efforts to drain the floodwater. "The water is still not going down. If you want it to go down by a metre, it's going to take up to a month," he told Khaosod news. "Many people told me, please talk to someone, don't make the kids escape through the water, it's too risky." But deteriorating conditions in the boys' makeshift shelter, where oxygen levels have dropped to 15pc, from a usual level of 21pc, are raising anxiety levels, particularly with a dire weather forecast for the coming week that could result in them being trapped for months. A key task on Friday is to lay a pipe into their chamber to provide more air. But a search to find openings above the roof of the cave, in the hope of lifting the boys out, have been stepped up. A team of bird nest hunters and cliff climbing experts has been drafted in to sweep through thick foliage on the mountain over the cave to find possible new shafts inside. But amid the sadness of the day, Fifa's president Gianni Infantino offered a glimmer of hope for the boys. "If, as we all hope, they are reunited with their families in the coming days and their health allows them to travel, Fifa would be delighted to invite them to attend the 2018 World Cup final in Moscow as our guests," he wrote in a letter to the Thailand FA. Manchester City and England star John Stones and Jurgen Klopp, the manager of Liverpool, were among several high profile football celebrities to offer messages of support. "It's so sad to see where they are and we're hoping and wishing that they get out safe and sound," said Mr Stones. "They won't see this but everyone, their friends and family, all of the boys, all the England squad, our thoughts are with them." Mr Klopp said: "We are hoping every second that you see the daylight again. You'll never walk alone." Representatives for billionaire entrepreneur Elon Musk are in talks about possibly assisting the operation.